This year Valentine’s Day turned out to be a lot of fun just hanging out with the family. I had wanted to get my wife something unique but still had that Valentine’s day feel to it. I also wanted something that would last forever. I wanted it to remind her of her two boys (myself and my son!). It seems as though Etsy is always a great place to look for obscure hand crafted items. While I have had a bad experience with Etsy in the past, I was able to find exactly what I wanted and decided to give it another shot. (If you aren’t familiar with etsy, it describes itself as a marketplace where people around the world connect, both online and offline, to make, sell and buy unique goods.) I knew what I was looking for and Etsy provided me with a few options to choose from. Valentine’s day seems to always force the thought of flowers, specifically roses, and of course that was the same thought in my mind. However, we have been down the road a million times, buying real flowers that don’t last more than a week and it is not unique. I thought it would be great to have a rose that would last forever and had a touch of masculinity in it to remind my wife of myself and my son. So I set out to find a rose made of steel. Luckily, I found a great guy in California that hand crafted these. His shop on Etsy is 4eveRose, and the direct link to the steel roses I purchased is HERE. These steel roses are made to order, so I sent a message to 4eveRose to make sure I could get these before Valentine’s Day. The response from him was extremely fast and he promised me they would arrive in time. There were also good ratings from previous buyers on Etsy for this seller. I proceeded with the purchase. They did in fact arrive in a timely manner and just as promised. The picture above is a picture I took of the actual roses I received. They are very unique. My only complaint is that the leaf on the one rose was not attached very well, but these aren’t being played with, so it won’t be a problem. The bluish tint really adds to the aesthetics of these pieces. If I had a need, I would purchase more from the same seller as my experience was very positive. My son and I wrote a card to my wife explaining how we wanted to get her something that would remind her of us. We wanted something tough and tender, a little rough around the edges, and something that she could truly see the beauty in . These steel roses fit that description, and it made my wife very happy. I like to just take a step back and watch my son. He plays. He learns. He figures things out. He laughs and he loves. 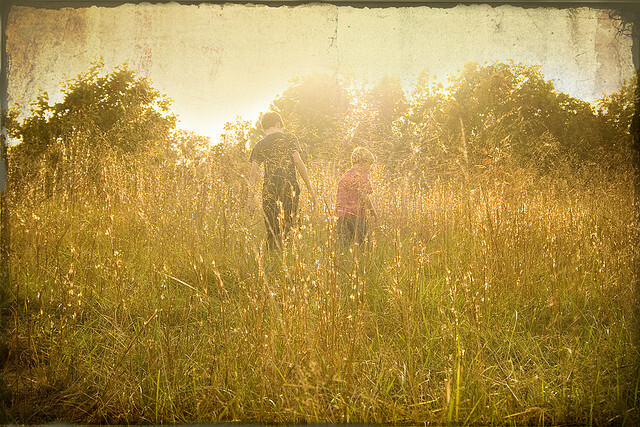 The beauty of being a child is the innocence. When I look at him, he teaches me what innocence is. He teaches me what it really means to be carefree. When he runs up to me and hugs me, I get lost in that moment, in that feeling of being a child, and that is what I am grateful for today. My little guy turns two this week, and it’s been an amazing two years. As time progresses we have new rituals we do each day. My wife would dance around with him when he was only a few months, and sing silly songs. The first summer we would sit out on the deck each day as a family and just laugh about everything. We would try to bring him for a walk a few times a week at the park. Now each night we put his PJ’s on, go and help him to brush his teeth, and then read stories in the big chair in his room. Ever since he was born, I would always pick him up right before going to bed, and hum a song (I can’t sing). Mommy would then give him a big hug and kiss and then I would put him in his crib. Just a few nights ago, he started something new. I put him down in his crib, he stands up, looks at his mommy and says “KISS.” Mommy gives him another kiss, and then he looks at her and says “HUG.” Hearing him say that and seeing my wife hug him brings a smile to my face for days. It also shows that at almost 2 years, we must have done something right. I came across a blog post today by a man named Kozo Hattori. The entry was named “Teaching Our Children to Love Their Enemies.” Reading this really made me think about the important principles in life that we need to teach, or rather SHOW our children. Being able to Love Thy Enemies is such a powerful message, yet I cannot say that I practice this belief myself. I am going to make it a point to work on myself and hope that in turn, I will be teaching my son by example, how to respect everyone and live a happy life. You can find Kozo Hattori’s blog post by clicking this LINK. Yesterday, there was a lot of hype about an epic blizzard that was coming through New Jersey. There was news coverage on all day and all night about the New Jersey “Blizzard of 2015” that was to bring up to 3 feet of snow. Just like they said, the snow did start in the afternoon, and continued into the night. A lot of schools had let out early and were already scheduled to be closed today. Businesses were already scheduling to be closed today. Last night, Governor Christie put New Jersey into a state of emergency and most people were not allowed to be on the road after 11 pm. So before I get into the disappointment of what actually happened, let me mention that the idea of the “Blizzard of 2015” really got me thinking about my planning for things of this nature, or rather my lack of planning. My biggest worry was what we would do if we lost power, which was a good possibility based on recent history. Luckily, my wife is amazing and always has us covered for food. We were also stocked up on water. The big issue though… what do you do about heat. My heater runs off electricity. I have no fireplace. While we can bundle up, I’m not so sure it would be that easy to keep my son under blankets for any period of time. Even with bundling up, and blankets, we have been through losing power, and the cold is not easy to manage through, and I would never want to put my son through that. The second issue is toilets. We have a well, with a pump that runs on electricity. No running water, means we cannot flush toilets. My preparation for this, is buckets that I fill with water in advance, and filling my bathtubs. I skipped on the bathtubs this time, because the temperatures are low enough, that if we did lose heat, the water could possibly freeze. So what was the real plan you ask? Living in New Jersey, I now always have at least one car with AWD. The plan was to drive in the horrible weather to the in-laws, because they have a wood burning stove. Not the best plan. We will chalk this up as a lesson learned, and I will be looking into buying a generator this week. It had been snowing during the day yesterday and we had accumulation. The roads were slippery when I came home from work. I went to bed having no clue if I would wake up freezing with no heat and no power, with 3 feet of snow outside. Based on all the news reports, I had to prepare for the worst. This was set to be a record breaking blizzard to go in the history books. Well, that didn’t exactly happen. I woke up to about 4 inches of snow on my driveway. It was the light fluffy snow that is easy to clear, but hard to make a snowman with. I ended up taking about a half hour to shovel my driveway. I did a quick meeting for work from home with a cup of coffee. Then I headed to the office. The traffic was great, because no one was on the road from all the news coverage. The roads were clear and everyone was traveling at the speed limit on the highways. This epic “Blizzard of 2015” will go in the history books, but as the most over hyped blizzard. As I pulled in the driveway after a long day of work today, I saw the very small snowman pictured above. 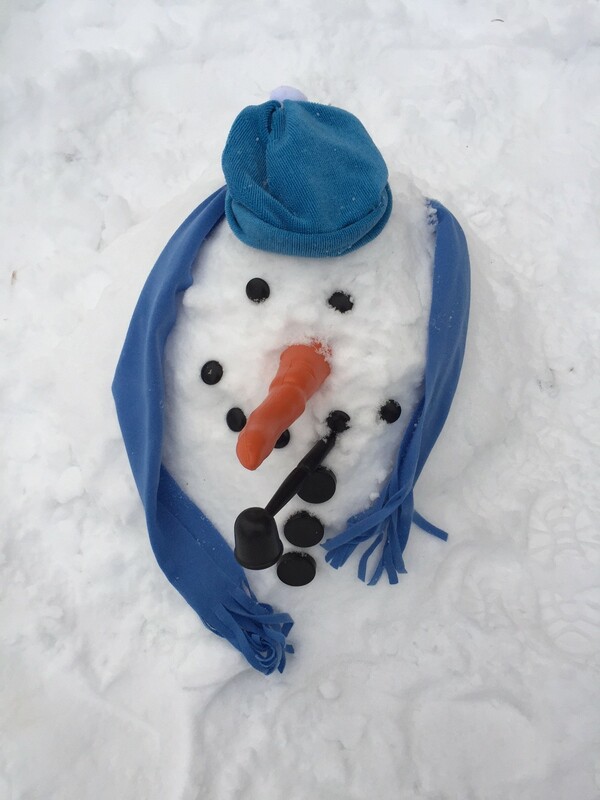 That snowman just made my day and put the biggest smile on my face. Even though the blizzard didn’t set any records, I’m just happy my wife and son had an amazing day together in the snow. Stay warm everybody. I admit it. I am not the best cook. Not even close. But I do love good food. 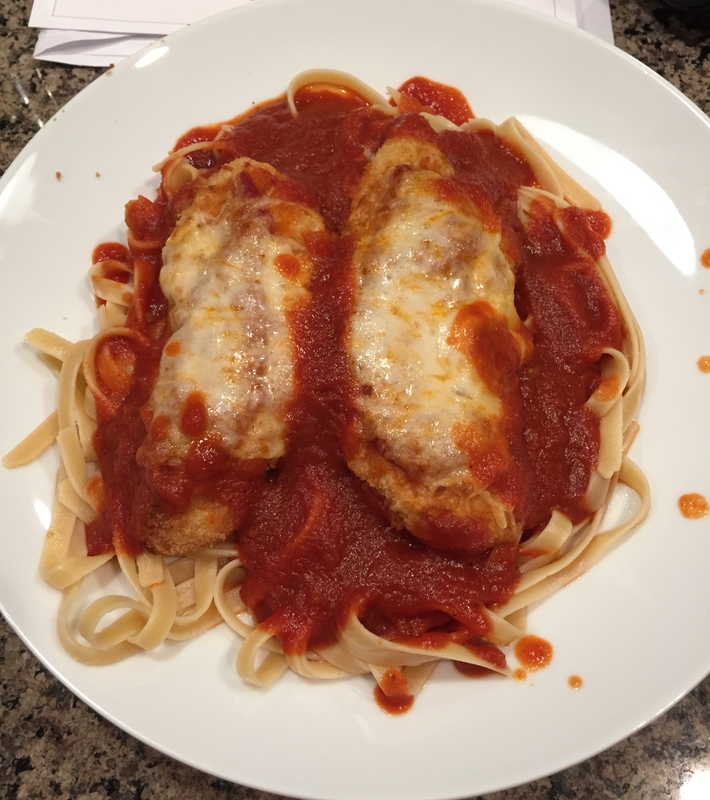 So here is an easy way to make an easy chicken parmigiana meal for the whole family. To start, I shop at Costco, and came across some delicious, already breaded, raw chicken. 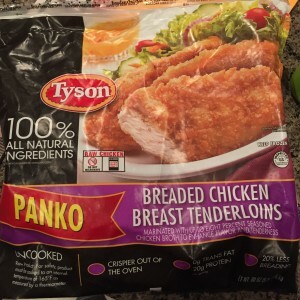 It’s made by Tyson and is labeled as “Breaded Chicken Breast Tenderloins.” Then you need some pasta sauce, mozzarella cheese, and some Parmesan cheese. I put mine over some linguini to complete the dish, but you can use any pasta you like. Heat the oven to 450 degrees. 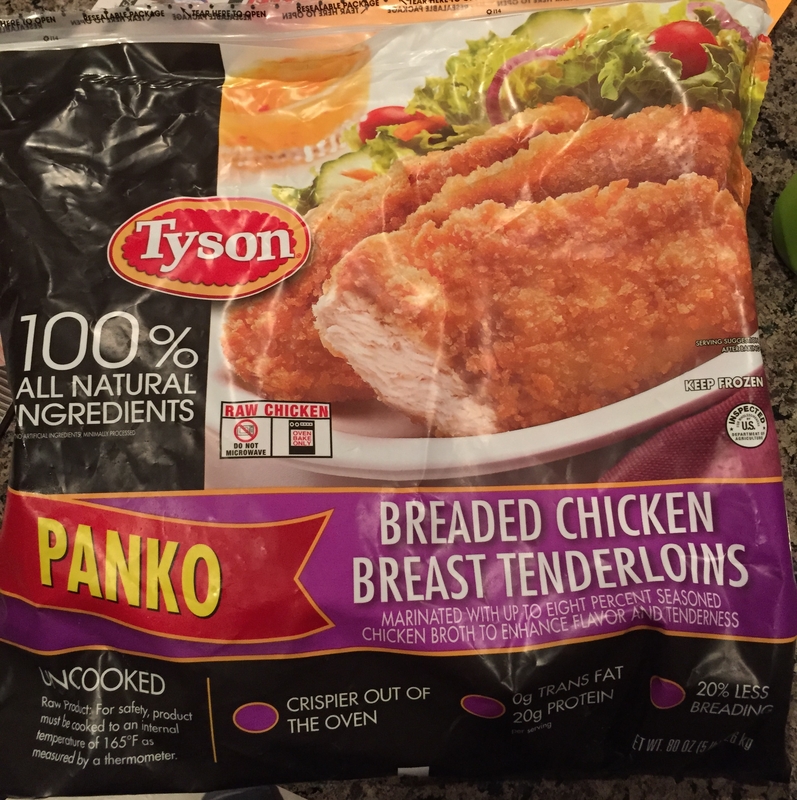 Throw a few of the breaded chicken breast tenderloins on a baking sheet. I put tin foil on the baking sheet also, for easy clean up. The chicken takes 20 – 25 minutes depending on your oven. I put a timer on for 20 minutes. When you put the chicken in the oven, you can start to boil your water and then add the pasta once boiling. Cook the pasta to desired softness. After the 20 minutes of the chicken in the oven, I pull the chicken out of the oven, but do not turn off the oven. On top of the chicken, add sauce, mozzarella cheese, and parmesan cheese. I then put the chicken back in the oven for another 5 minutes, or until the cheese is melted and a little brown on top. Once this is complete pull the chicken out of the oven and turn the oven off. Get some plates, add pasta, and then put the chicken on top. Add some extra sauce as desired (I put way too much on the one in the picture). Enjoy! I wish they had a Sky Zone when I was a kid. This was actually our second family trip to Sky Zone. We ventured out on a Sunday morning with plans to meet a friend and her son also. Sunday mornings have a toddler time which is for children up to age 5. Toddler time is from 9Am to 11Am, and only costs 10 dollars for the full 2 hours. That includes the price of their special orange socks that must be worn on the trampolines. Parents can go in with the child (parents cannot jump with the toddlers though) without additional cost other than for the orange socks they must also wear. The cost of socks alone is 2 dollars. The 10 dollar cost is a very discounted price since the children are so young. I have to say that toddler time is awesome. Firstly, from 9 – 10Am, the only things going on are toddler time, and a workout program for adults in a different area. They have one arena (I use this term for the trampoline area in the picture) that only allows toddlers, so there is no worrying about older kids or adults colliding with your little ones. They are also very relaxed with some of the rules that older kids and adults must follow. In this arena the kids are free to run around and jump from trampoline to trampoline, rather than having to stick to one trampoline. I loved watching my (almost) 2 year old just run around and bounce. They also have very soft balls the kids can play with. Its a great place for kids to interact also. The best part is that the kids can get a little wild, and you don’t have to worry about them hurting themselves because of all the padding. Sky Zone also has some other areas. One being a huge foam pit with trampolines setup to jump into it. The other being long trampolines with basketball hoops. The toddler time allows for them to use these areas also. My son LOVED the foam pit. From 9 – 10, since there are no older kids, it is the perfect time to let him play in the foam pit. Once again, the rules are a bit more relaxed since the kids are so young. At 10, these areas are also available to the older kids, and lines start to form. I would recommend getting your kid into the foam pit early, and then retreating back to the toddler arena from 10 – 11. The foam pit is extremely tiring, so after about an hour, its probably time for them to relax a bit more. This place is so much fun though. 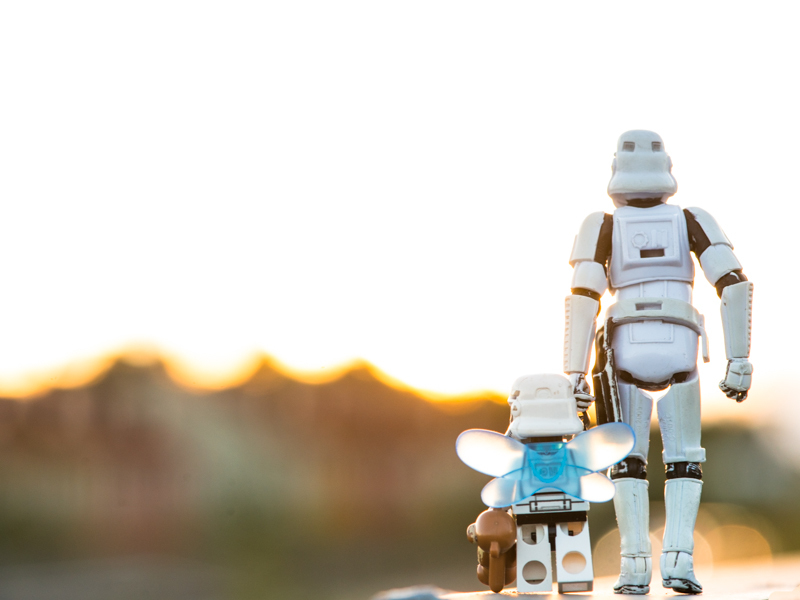 My son loves it, and so do I. I recommend this as a very fun activity for the whole family. And if you are up for it, get yourself an hour of jump time with the big kids! 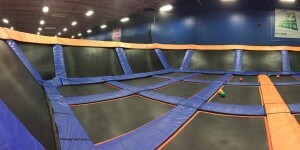 You can check out Sky Zone at http://www.skyzone.com. Today I am officially beginning to blog on the new Daddy Naps site. The page is still in the works, but please check the about section to read a little bit more about the blog. To start, let me explain my idea of the name Daddy Naps. The name daddy naps is something that makes me laugh. So many times, my wife and I have looked at each other and told ourselves that we will catch up on some sleep by taking a nap when our son takes a nap. We put him down to sleep, we clean up a bit, do some chores, take a shower, run out for a quick errand, and then just when that fabled myth of a nap is about to come, we hear that sweet little voice of our son having just woken up. I love that almost two years of being a father, I still tell my wife that I will be taking Daddy Naps on certain days, as if it will really happen one of these days. The idea of Daddy Naps also makes me think of a recent Nyquil Commercial (Vicks NyQuil – Dave Sick Day 2014). The father peeks his head into a room, obviously sick, and states that he needs to take a sick day tomorrow. The camera than cuts over to his child in his crib, as if you can take a sick day from being a parent. This commercial cracks me up, so I will leave you with this quick youtube clip, and make sure to check back for everything dad related. – and much much more!!!!! There is nothing more amazing than seeing your child smile!